Killer Sudoku-X puzzles include all the rules of regular Sudoku-X but add in dashed-line 'cages' which must sum to given values. Killer Sudoku-X is also sometimes known as Sumdoku-X, Mathdoku-X or Addoku-X. Killer Sudoku-X adds both diagonal "X" regions and also additional "Killer" regions to a regular Sudoku. 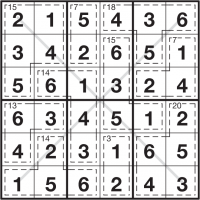 Taking the "X" part first, while in a regular Sudoku puzzle you must place each of the numbers 1 to 9 (or 1 to the size of the puzzle) into each of the rows, columns and bold-lined boxes, Sudoku-X extends this with two new diagonal regions which must also contain one of each number. These are marked on the grid so you don't forget them. Taking the "Killer" part next, Killer Sudoku adds dashed-line cages which must contain numbers that add up to a given total - and no digit can repeat in any dashed-line cage. So Killer Sudoku-X combines the Sudoku-X and Killer Sudoku variants of Sudoku into a single puzzle. Look at the solved Killer Sudoku-X puzzle on the left. In this 6x6 puzzle notice how each of the marked diagonals contains one each of 1 to 6. Also consider the '7' cage in the top-middle of the puzzle. The values in it are 5 and 2, which add up to the given clue, 7. Remember that you cannot repeat a number within a cage. This means that the solution to the 7 cage on the right-hand side of the puzzle must be 1+2+4 in some order, since any other solution over three squares would repeat a number. For example 2+2+3 would be invalid. Every Killer Sudoku-X puzzle only ever has one possible solution, and it can always be reached via reasonable logical deduction. In other words, guessing is never required. Killer Sudoku-X puzzles on puzzlemix appear at a wide range of sizes and difficulties. Usually they are 6x6, 8x8 or 9x9. In each respective case you must place 1-6, 1-8 or 1-9 once each into every row, column, bold-lined rectangle and marked diagonal. Are you searching for help with Killer Sudoku-X puzzles? Stuck on solving Mathdoku-X? Don't know the instructions for Sumdoku-X? Need Adddoku-X instructions? Want solving hints and tips for Killer Sudoku-X? Then puzzlemix is the place for you to play Killer Sudoku-X puzzles online. Looking for printed Killer Sudoku-X puzzles? Visit Sudoku Xtra for puzzle magazines and books. Or are you looking for a Killer Sudoku-X puzzle supplier? If so then check out Any Puzzle Media, my puzzle production company.